Okay, my mozzarella team in the cheese making class I recently took at MCCC didn’t have quite the success we’d hoped for. We think it’s because we quadrupled the recipe, and it was just too much volume of milk to heat evenly and form curds. Nonetheless, we had a great time, thanks to our instructor Frank A. Campione. You can read all about the class, and get some mozzarella hints, in my 10/23 In the Kitchen column in the Packet. Meanwhile, here’s the mozarella cheese recipe. Whatever you do, don’t quadruple it! Equipment – measuring spoons, liquid measuring cup, 6 qt or larger stainless steel pot, slotted stainless steel spoon, thermometer, stainless steel strainer, microwave bowl, optional lined rubber gloves. 1. Measure and line up ALL ingredients and ALL equipment. 2. Crush rennet tablet and dissolve in cold chlorine-free water, or add liquid rennet to the water. 3. Place pot on stove, pour in milk. Turn heat to medium-high. Sprinkle citric acid on top and GENTLY STIR but NOT OFTEN. 4. Heat milk to 88 degrees. There will be some small curds. This takes about 10 minutes. At 88 degrees, add rennet/water by pouring it over the slotted spoon to help distribute it in the milk. STIR VERY GENTLY to incorporate, BUT DON’T BREAK UP THE CURDS. 5. Continue heating to 105 degrees, about 5 more minutes. TURN OFF THE HEAT. If using electric stove, move pot to cool surface. 6. You should now have a mass of LARGE FIRM CURDS and light green colored whey. Spoon or carefully pour the curds into a strainer, then transfer the curds to the microwave safe bowl. 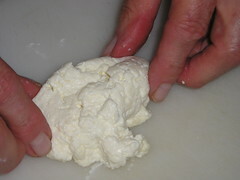 REMOVE AS MUCH OF THE WHEY AS POSSIBLE BY SQUEEZING THE CURDS very much like packing a snowball. ADD SALT if desired. 7. Microwave on HIGH for about 1 minute. Remove and squeeze out the whey. Then replace back into bowl. 8. Return to microwave TWO MORE TIMES for about 35 seconds each, packing the curds together, squeezing, and draining whey each time in between. 9. The mozzarella should start to come together during this process. Turn out onto a clean work surface and help it along by kneading it. It should be smooth, shiny and stretchable. If it cools down too much you may need to reheat it for 10-20 seconds.